This Tableau training course will help you master the Tableau Desktop 10 data visualization and reporting tool. You’ll learn how to build visualizations, organize data, and design dashboards to empower more meaningful business decisions. And you’ll be exposed to the concepts of statistics, data mapping and establishing data connections. The course includes four industry-based projects and two simulation exams to prepare you for the Tableau Desktop 10 Qualified Associate certification. Everything we do is increasingly contributing to huge amounts of data which can be leveraged by organizations to increase their business. 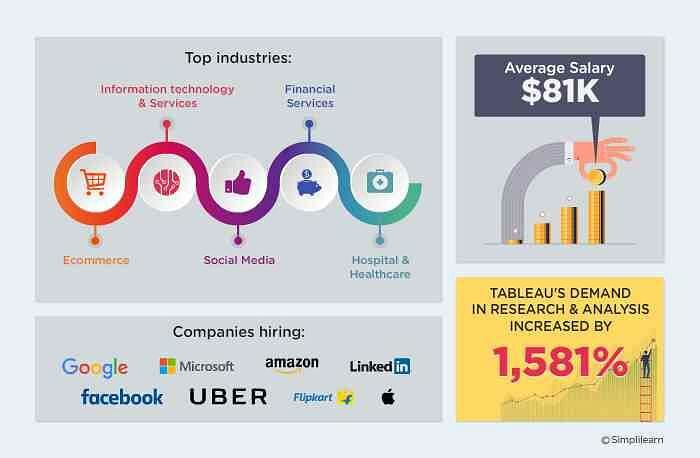 Organizations across the world make use of Tableau to analyze this huge amounts of data and derive actionable insights from it. Tableau can help you to create complex and beautiful data visualizations. With its intuitive and user-friendly approach to data visualization, Tableau is today, a popular choice for big and small organizations. Tableau Desktop 10 is one of the most widely used data visualization, reporting and business intelligence tools in the world and has regularly been ranked as a “leader” in the Gartner Magic Quadrant. Tableau is simple to use and has extensive visualization capabilities that make it the reporting tool of choice for enterprises around the world. The Tableau online training provided by Simplilearn is designed to ensure you pass the Tableau Desktop 10 Qualified Associate certification exam and are ready to begin a new job assignment requiring Tableau Desktop expertise. The Tableau training focuses on acquiring important skills you can use on the job such as using statistical tools and analytics, creating reports and dashboards, and mastering the many aspects of data visualization. What skills will you learn with this online Tableau training course? Who should take this Tableau training course? What projects will I be working on? The head of Product Management of a retail products company is responsible for determining which products his company should continue to offer for sale and which products should be discontinued from the company’s product catalogue. He wants to build a dashboard that will present monthly sales performance by product segment and product category to help him identify the segments and categories that have met or exceeded their sales targets, as well as those that have not met their sales targets. The head of Sales for a retail products company is responsible for increasing business from the company’s customers. He wants to build a dashboard that will present some statistics about the customers, a ranking of the customers by Profit Ratio, and a breakdown of each customer’s sales and profit performance. This information will be broken down by Region so that he can analyze the differences in customers across the company’s geography. He also wants to be able to break down the information by Segment, by Category, and by Year or Order Date. The head of Product Management for a retail products company is also responsible for product pricing. He needs to determine if his products are appropriately priced to maximize both sales and profit ratio. He wants to build a dashboard that will present sales by product category over time, with the ability to drill down to the product and regional level. He also wants to be able to click on a specific product name to do a Google search for that product and to look at competitors’ pricing levels. The CEO of a retail products company is very focused on the sales of the products her company sells, as she needs to deliver a presentation on the company’s sales results to the company’s Board of Directors every quarter. She is also interested in sales performance across the company’s four regions, as she is also responsible for setting sales performance targets for her sales teams in each region. She wants to build a dashboard that will present some metrics about products (such as sales, profits, profit ratio, etc.). She also wants to be able to see the trends of these statistics over time, and be able to filter down to one, more than one, or all geographic regions. How do I unlock my Simplilearn certificate? Who provides the Tableau certification and how long is it valid for? Upon successful completion of the Tableau training course, you will be awarded an industry-recognized course completion certificate from Simplilearn which has a lifelong validity. I had taken The Tableau training program from Simplilearn. This is the first time I have completed the online learning, earlier I attended classroom training. But now considering the way Simplilearn taught, arranged course, their continuous support during the session etc, I will go with Simplilearn in future as well. I like the support provided on chat and emails. Really amazed with the support, Thanks for standing with me for all my concerns. Thanks again and looking forward to a lot more learning on Simplilearn! I was working as BI Consultant in leading IT Company and wanted to add on to my knowledge and skills. After all the research based on my experience, demand and time span for learning and implementing things based on new skill, I decided to learn Tableau. I went through to different sites which provided the basic course for Tableau. After going through content ,course material and fee structure, I decided to go for Simplilearn's Tableau course. The course is structured and presented in such a layman way that anyone without any technical Knowledge can easily grasp the content and self-learn. Most amazing part was they were providing access to Tableau along with Licence. Each and every query raised was answered quickly. In addition to above simulation test are also there which are indeed very helpful for further Certification in Tableau. I would really recommend this course if you are keen on learning Tableau. I would like to appreciate and convey my BIG THANKS to the entire Simplilearn team. The training was excellent. Appreciate the trainer's capability to answer all the queries. Thanks to Simplilearn for such a good course content. The trainer has great knowledge about the subject. She interacts well with all the participants. All the queries were answered appropriately. Simplilearn's Tableau 10 certification is simple, effective and easy to learn. The certification helped me grow my career from a Senior Project Engineer at SPSoft Private Ltd. to Lead Consultant at Deloitte with a salary hike. My learning experience with Simplilearn started about 18 months ago and have been continuing. I have got some excellent support from their consultants in meeting my learning demands. They have persistently supported my queries and learning needs, through which I could achieve 2 certifications now. Appreciate Simplilearn for the support and variety of courses that they could offer on various skills / career paths in the industry. Thank you! Simplilearn provides labs for all the hands-on and projects execution. The learners will be guided on all aspects, from deploying tools to executing hands-on exercises. Our teaching assistants are a dedicated team of subject matter experts here to help you get certified in your first attempt. They engage students proactively to ensure the course path is being followed and help you enrich your learning experience, from class onboarding to project mentoring and job assistance. Teaching Assistance is available during business hours for this Tableau training course. Online classroom training for Tableau Desktop 10 Qualified Associate Training is conducted via online live streaming of each class. The classes are conducted by a Tableau certified trainer with more than 15 years of work and training experience. If you enrol for self-paced e-learning, you will have access to pre-recorded videos. If you enrol for the online classroom Flexi Pass, you will have access to live training conducted online as well as the pre-recorded videos. Upon successful completion of the Tableau Desktop 10 Qualified Associate Certification training, you will be awarded a course completion certificate from Tableau. We offer 24/7 support through email, chat, and calls. We also have a dedicated team that provides on-demand assistance through our community forum. What’s more, you will have lifetime access to the community forum, even after completion of your Tableau training course with us to discuss Tableau related topics. How do I enrol for the Tableau online training? I’d like to learn more about this Tableau training program. Whom should I contact?